Amanda Holden’s translation is full of sparkling, juicy lines. The translation of Elisir was the first of several commissioned from Amanda by English Touring Opera. Stephen Medcalf’s sunny production – designed by Isabella Bywater and set in the american mid-west – opened at the Theatre Royal in Bath on 20 October 1993 with Mary Plazas as Adina, conducted by Andrew Greenwood. 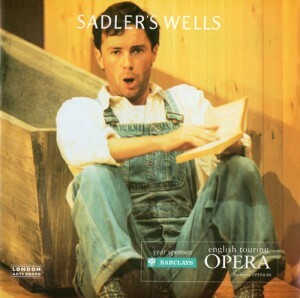 During the second stage of the 1993/4 tour, which opened at Sadler’s Wells, London, the role of Adina was sung by Susan Gritton. There have been many other productions using this text: the original Medcalf production has often been revived too, most recently by Victorian Opera, Melbourne in 2008 with Elena Xanthoudakis as Adina. she loves me, I know it, yes I know. her heart would then reply! I’d whisper and I’d wait to hear her sigh. since I so love her, I love her so. for you the price is low. will be faced with mass destruction. I’ve got them all on show.